Hanoi (VNA) - When it comes to social housing or affordable housing for low-income earners, funding is usually a key factor in such projects. However, once the projects are completed, problems in planning, investment management and efficiency tend to crop up. In Hanoi, poor planning has been blamed for the high demand for low-cost housing and disused housing projects. Late last month, the Ministry of Construction agreed to re-designate three apartment buildings meant for students in Phap Van - Tu Hiep New Urban Area to social housing for other low-income earners. The State-funded dorm project consists of six apartment buildings in Phap Van - Tu Hiep New Urban Area in Hoang Mai district. The project began construction in September 2009 and was expected to provide accommodation for 22,000 students. Since January 2015, three apartment buildings have been completed with more than 1,200 furnished apartments, each apartment nearly 57 sq.m for eight students priced at 205,000 VND per person per month. The rental price is a third or a quarter of prices offered by private landlords. When the project was announced, as many as 15,000 students of universities and colleges in the project’s neighbourhood applied for accommodation. However, so far, just 30 percent of completed apartments are in use. The low uptake of the apartments has been blamed on a lack of public infrastructure around the buildings putting off students. As soon as the Construction Ministry decided to change the dorms’ use, it called on Hanoi to speed up developing social and technical infrastructure to meet demand. A shortage of public infrastructure has also caused other social housing in the heart of industrial zones to be unused, despite the workers being in dire need of lodgings. For example, twenty four apartment blocks with 1,084 rooms have been completed in Kim Chung commune, Dong Anh district, to serve about 10,000 workers who work in Bac Thang Long Industrial Zone. However, just 7,000 workers have decided to live there. 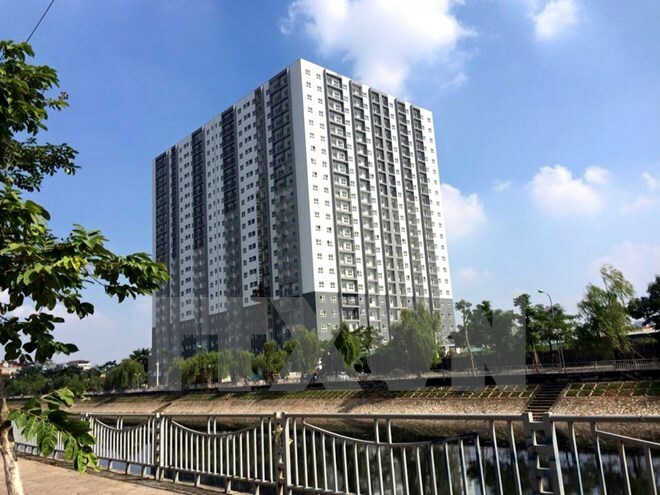 Other low-cost housing projects including Hoang Cau Resettlement Project in Dong Da district, a 20-story apartment building on Ta Quang Buu street in Hai Ba Trung district and a resettlement area in Bac Tu Liem district also failed to attract home seekers. Poor quality and lack of public infrastructure like road, water supply or schools are said to be too great inconveniences, despite the low rental prices. Experts said the problem was a result of policymakers caring more about the number of home seekers when developing social housing projects rather than considering their needs. Vice President of the Vietnam General Federation of Labour Mai Duc Chinh said that in many industrial zones in Vietnam, just five to ten percent of workers had housing arranged by an IZ. However, housing for workers seemed merely a means to provide them a place to sleep after work, he said, adding that schools or entertainment areas were needed for workers’ social and spiritual lives. Former head of the Housing and Real Estate Market Management Department Nguyen Manh Ha said that in some cases, people did not want to move to resettlement areas as the quality of houses and public infrastructure was lower than near their former homes. Modest compensation fund was part of the reason for the low-quality resettlement works, Ha said. “Hanoi will have to arrange to resettle thousands of families to make room for about 2,700 upcoming projects, meaning there is a high demand for resettlement housing projects,” he said. To attract people to such projects to avoid completed housing projects being disused, the benefits of all involved parties must be ensured, he said.